In a large soup pot sauté onions over medium-low heat in 3 tablespoons of olive oil and a generous pinch of salt. Cook onions for approximately 5 minutes or until they are soft and yellow. Add garlic and cook for an additional two minutes. Stir often, being careful not to burn garlic. Add carrots and celery to pot, continue to cook for an additional 5 minutes, stirring often. Add bay leaves, thyme, basil, oregano, black pepper, red pepper flakes and salt. Add tomatoes, vegetable broth, kidney beans and chickpeas to pot. Combine well. Simmer covered over low heat for 20 minutes. Add in spinach and peas, stirring until peas are cooked. Looks so good! 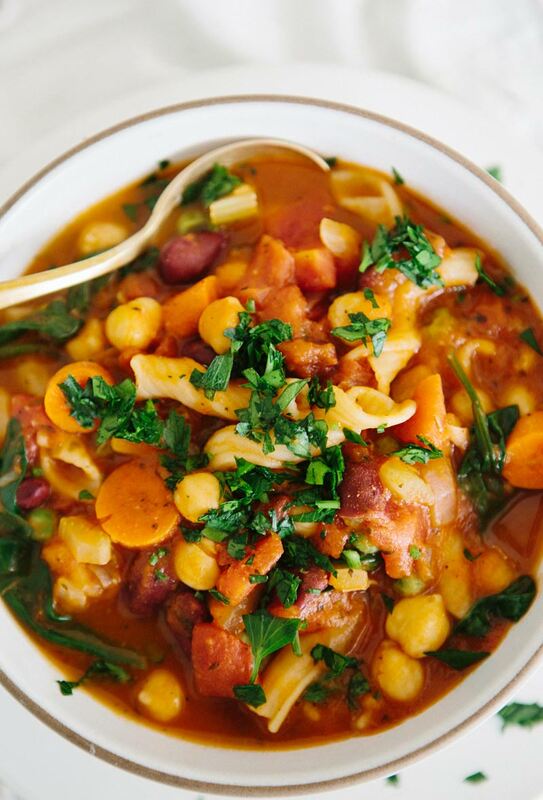 I love having a big pot of soup on the stove – makes my house feel extra cozy in the winter! I must make this soup asap! It would be the perfect meal while sitting in front of the fireplace. Recently switched to a strict non-dairy diet, and can’t wait to try this! It looks sooo good. This looks so yummy and beautifully photographed. Was just making my grocery list. Trying to decide which soups to make next week. I think this one just made our menu this week! Yum! I just made this for my husband and kids. 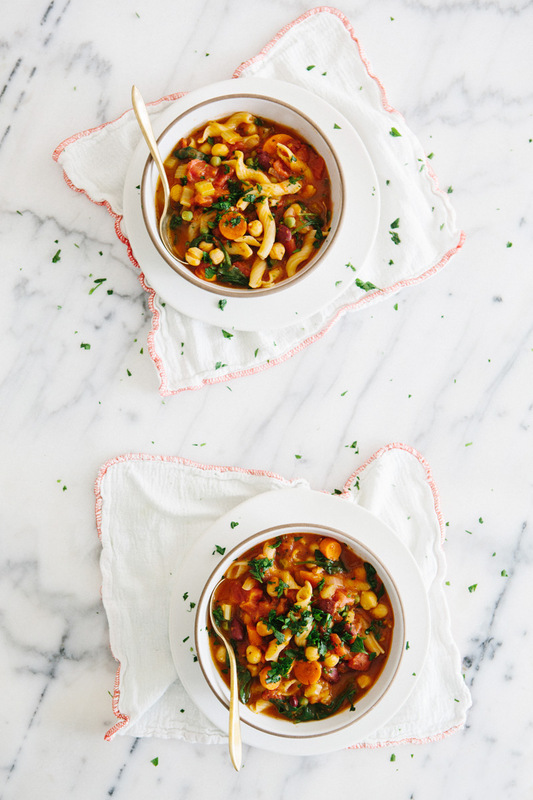 We’re vegetarian and I have made many minestrone recipes, but this was especially tasty. We loved it, Sarah. Thank you! 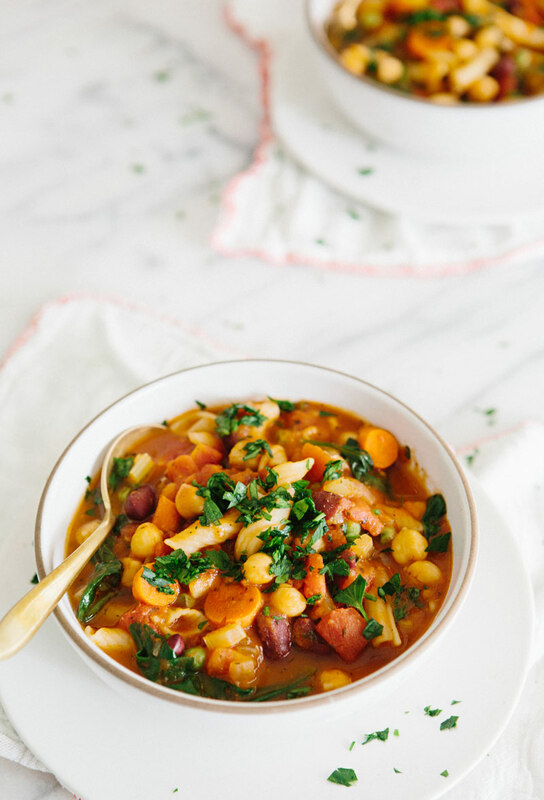 Chickpea minestrone is a wonderful idea! I love this soup. The chickpeas in the Minestrone sound great.Will try it soon. This looks so good! Curious: how many servings does this make? I made this soup tonight for a sick family including myself! It was amazing. Everyone loved it!! I followed the recipe exactly. Thank you!! Made this receipt, it was great but added garbanzo beans also extra can of tomatoes , it was so good we live on soups in winter thank you so much. Hello,I log on to your new stuff named “chickpea minestrone – A House in the Hills” regularly.Your writing style is witty, keep up the good work! And you can look our website about proxy server list. Hello,I read your blog named “chickpea minestrone – A House in the Hills” daily.Your humoristic style is awesome, keep doing what you’re doing! And you can look our website about proxy list.